Ginny and Leon had a wonderful life together living in a two-bedroom apartment in Toronto. The way they met is almost like it is written in fairy tales. But the fairy tale ends sadly, when Leon passes away. Heartbroken, empty and with no expectation, Ginny after sometime gets an idea to start baking. Every time she bakes something new, Leon, from death comes to taste them, as if he was approving her work. So when he does, her color changes. The light of life comes back to her, because it was the only way to overcome the death of Leon. As it was mentioned above, Suri Parmar’s The Bakebook follows a rather incredible love story that continues even after death. When the animated short film begins, from the opening scene you quickly learn the story behind Leon and Ginny and how they met. After that, it follows the day when they share a drink at an event, a day when they knew they were meant for each other. Shortly after that, happiness turns into mourning, when Ginny finds out about Leon’s death. She wears a black dress, gets ready for funeral, but then closes the door, turns her back, and finds Leon, rather his ghost, who hands her Easy Baking for Beginners book. Yes, Ginny blossoms from that moment on. She is happier, her life is fulfilled and there is no darkness for her anymore… But this story is not like from fairy tales… because, in this case, the only thing from this fairy tale that lives happily ever after is the true love story of Ginny and Leon. With six minutes only, Suri Parmar manages to steal the viewers heart. 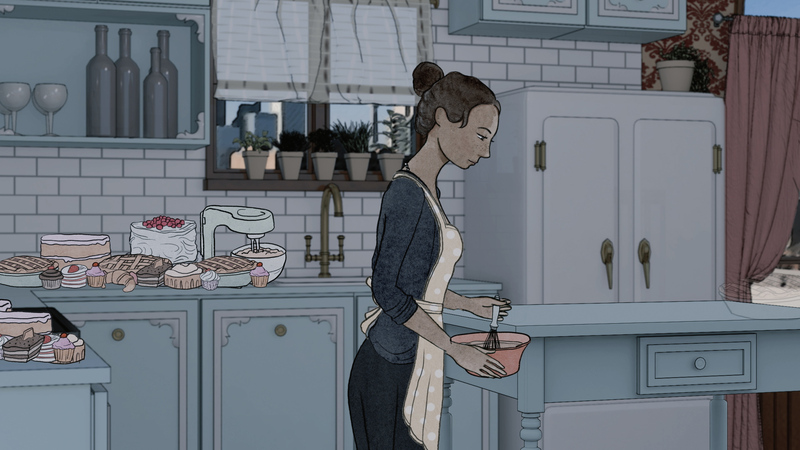 The Bakebook is beautifully animated, but keeps it simple. The color will please your eyes, but its story will make the tears to run down from them. It has an interesting approach, great concept, and something you would not like happening in real life, but if it does – it gives an aww feeling. Is there any moral in this story? Maybe yes, maybe no. But one thing is for certain – the death of a loved one can be overcomed, but the truth is – never completely. And Suru Parmar’s wonderful movie is proof to that.